Prepare for your beauty look with a clean, moisturized, and primed face. Eyebrows frame the face and are usually the first thing people notice about you--so I always start by taming them. If they are already tamed but need a little defining, begin by filling in your brows in light strokes with MAC Eye Brow Pencil in Spiked. With a gentle hand, this brow pencil can give shape to the sparsest of brows while still appearing natural. Next, I like to give a little dimension to the eyes. The MAC Mineralized Eye Shadow Duo shown above can give you shimmer on your lid to make your eyes pop, a matte taupe in your crease to give your eyes definition, and a bit of glow under the brow bone for a fresh, radiant overall look. These rich, long-lasting shades will have bae staring in your eyes all through your date night dinner! To further define your eyes, line the upper lash line with MAC Eye Kohl Liner in Black. I usually line the outer rim of my bottom lash line (instead of the entire bottom lash line) as well. To give your lashes a boost without adding falsies, apply MAC False Lashes Extreme. This mascara's formula gives the illusion of full, false lashes! Now moving along to the face, the first product I apply is the MAC Prep n Prime Highlighter in Peach Luster. I brush a small dab of it on my dark spots (and the under eye area if needed) to cancel out the dark area before applying concealer. (NOTE: If you have no areas to conceal, you can actually skip a couple of steps and move right along to number 7). Then we continue our concealing by blending a light touch of MAC Mineralize Concealer over the places you applied the highlighter in the last step. Set your foundation with MAC Mineralize Skinfinish Natural, my holy grail setting powder. It gives such a flawless, yet natural finish to your face. To give your face a boost of "flush and glow," add the beautiful MAC Blush in A Little Lusty to the apples of your cheeks, and MAC Mineralize Skinfinish in Gold Deposit above the cheekbones + down the bridge of your nose. A Little Lusty's warm undertones look so beautiful on brown skin and you already know how I feel about the beauty that is Gold Deposit. To finish up the look, add an application of MAC Matte Lipstick in Russian Red to the lips. To make sure your red lipstick really POPS, be sure to clean up around the perimeter of your lipstick application with concealer. 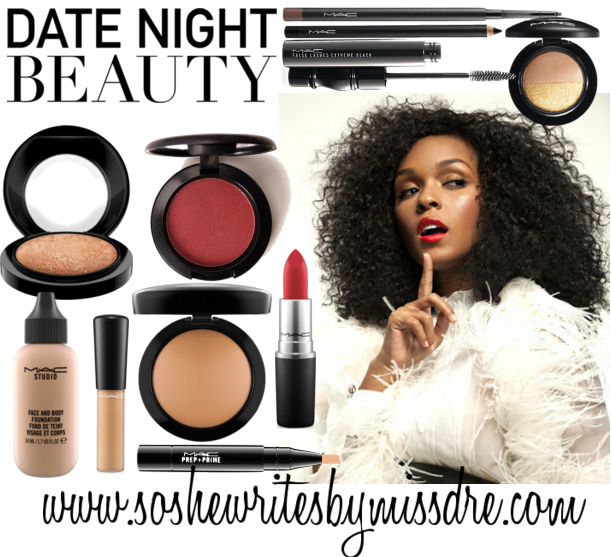 that has you date night ready with one quick run to the MAC store! Stay tuned to the drugstore beauty version of this look coming soon! Be sure to check out Janelle Monae along with cast mates Taraji P. Henson and Octavia Spencer in their upcoming film, Hidden Figures, releasing on Christmas Day!